The Feijoa (Feijoa sellowiana, synonym Acca sellowiana), also known as Pineapple Guava or Guavasteen, is an evergreen shrub or small tree, 1-7 m in height. 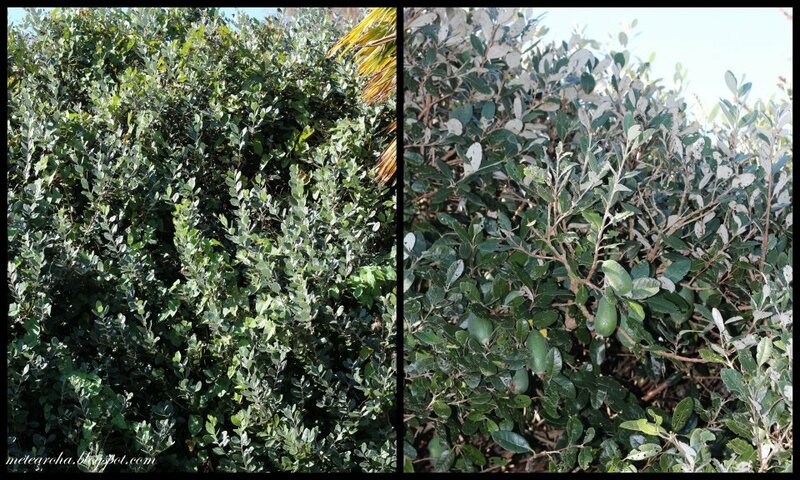 It comes from the highlands of southern Brazil, parts of Colombia, Uruguay, Paraguay and northern Argentina. They are also grown throughout New Zealand. The fruit matures in autumn and is green, chicken-egg-sized, and ellipsoid-shaped. It has a sweet, aromatic flavour. The flesh is juicy. 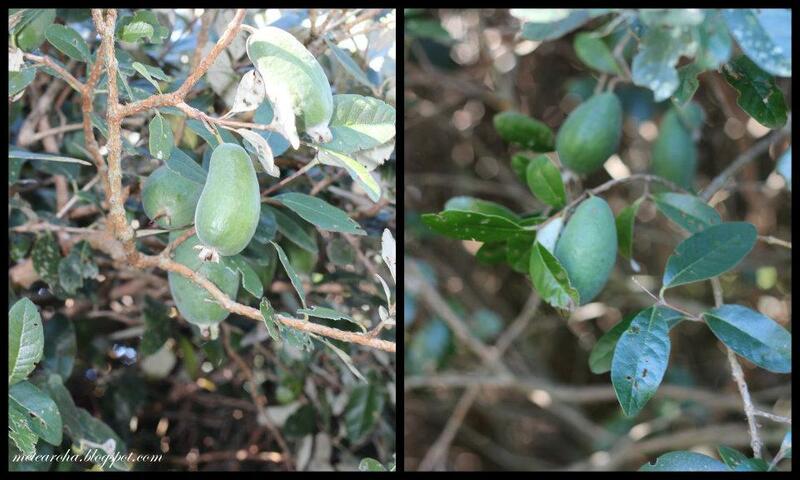 The fruit drops when ripe, but can be picked from the tree before to prevent bruising. 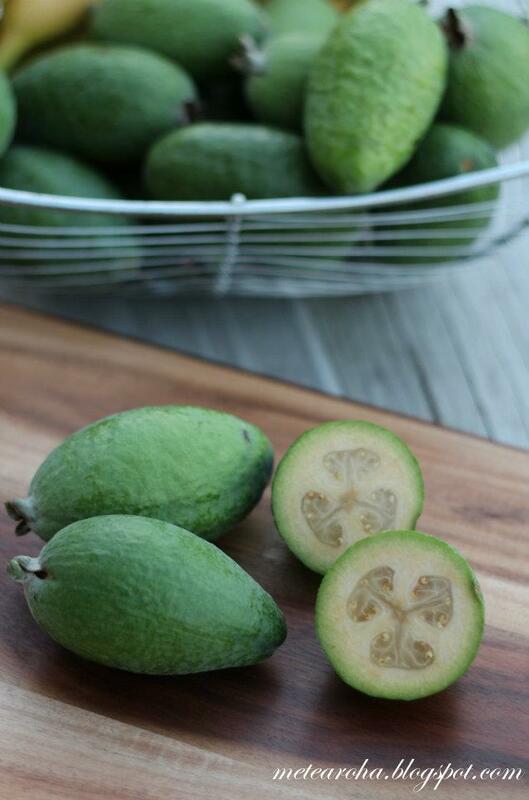 Feijoa fruit have a distinctive smell. The ester methyl benzoate smells strongly of feijoas and the aroma of the fruit is caused mostly by this and other closely related esters. This is how it's eaten.....cut into half and scoop it with a spoon. You can see the tiny seeds and the 'jelly' like centre, this indicate the fruit is ripe. The seed has the same texture like a guava. When hb first introduced this fruit to me, I really didnt like it. The smell was kinda strong when I first had it. It was as if I was eating perfume. Texture wise reminds me of the pink guava and they taste sweet and sourish at the same time. I sort of can accept the fruit right now but am not really a big fan of it. I know to choose the ones that has just ripen as these ones doesnt smell too 'perfumey' hehehez and the texture is just right for me too. The overly ripen ones.....are good for baking. Just like bananas....the riper they are the better they will be for baking. These trees are located just beside my neighbour's house it belongs to them of course. 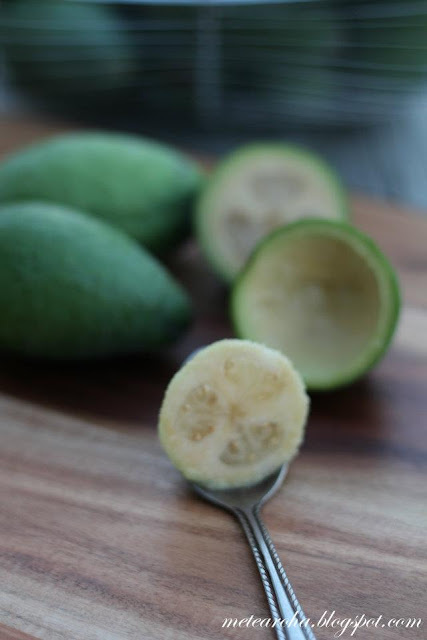 We were told to help ourselves to the fruits bcos feijoas have a short season and doesnt have long shelf life. Once matured, they will fall off the trees or u can pick them from the trees if u think they are ripe. Once picked they will last abt a week in a fruit basket. It's in season right now and cost abt $8 a kg at the supermarkets and abt $6 a kg at the fruit shops. Sometimes hb's work mates will share bags of feijoas with us. They are yummy when baked into cupcakes, cakes, crumbles or muffins. I usually used a banana cake/muffin recipe and substitute the bananas with feijoas. They are yummy as fruit juice and chutneys too. Most kiwi's home have these fruit trees in their garden. Btw the fruit looks alike with our local guava but i believe the taste totally different. Syiok aar settle down @NZ, which personnally one of the country that i admire. Been there during our short trip in may 2009 & really love the sceneries. Masa dkt sg dgn m'sia...I tak pernah nampak buah ni. Jadi kalau nak rasa kena lah dtg sini hehehez. Mmg feijoa ni ada texture macam guava yg sangat juicy bila kita makan. Tapi kalau dah terlalu ranum....wanginya ya amat. I really dont like it hehehez. Alhamdullilah NZ is my home now. Mula2 dtg mmg asik pikir nak balik sg aja ahakkkkss. Byk perbezaan drpd sg 'the city that never sleeps' Sini very quiet and tranquil, kadang2 bosan tapi skarang dah boleh adapt dah. 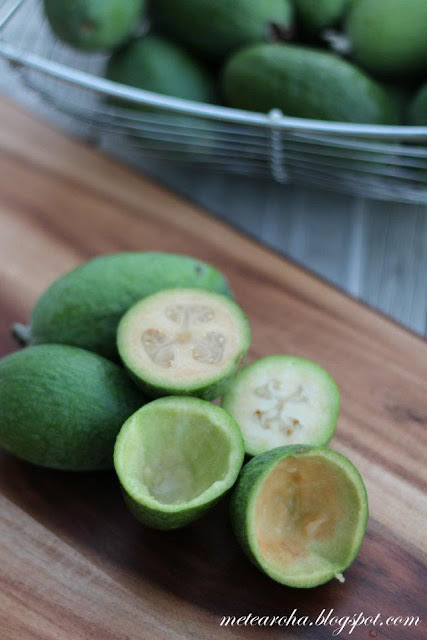 If iit is similar to pink guava in taste, I rasa boleh la I try this fruit.One question, though, the 'j' in the feijoa tu pronounce as bunyi 'h' as the spanish word 'J'ose? is it? Not really taste like pink guava. Tapi the seeds ada texture mcm makan guava. Buah ni rasa masam and manis and wangi and lembut and juicy at the same time hehehez. Braper byk punya and. Guava mcm rangup gitu kan. Ni macam makan pear yg dah ripe giler tapi texture mcm guava. Begitu lah kalau u baca and got confuse sbb I pun confuse....I dah tak tau macam mana nak explain lagi wahahahaz. If the fruit can be 'transformed' into chutneys, then it can be made as jam as well. Ada orang buat jem tak? My hb asked the same question yesterday ahakkks. He asked me kalau I can transform them into preserves. I tak pernah nampak jam feijoa and I tak pernah buat jam. Maybe homemade ada kot....commercially tak pernah nampak. Yes, you can get feijoa jams in many of the Delis in Auckland.Infact, one of my friend here makes jars of them every season.Also, another friend actually makes vinegar out of it too.As for me, I simply hate fresh feijoa but I simply love the chutney. Tks for the info dear ;) I havent been around auckland much. Was there last yr with my bestie but we only roamed Queen St...dont know where else to go ahakkksss. I have never tried feijoa chutneys nor jam. I dont mind having 1 or 2 fresh feijoas but luv them as cupcakes or muffins hehehez. All photos and other contents are copyrighted to metearoha.blogspot.com. Unless expressed permission has been granted by me of metearoha.blogspot.com, you may not copy any photos and contents from this site. Using photos and contents other than shared recipes from this site without permission is prohibited. Salam, thank you for visiting my blog. I am a Malay Singaporean SAHM residing in New Zealand. Married to a kiwi hb & mumma to a 4 yrs old girl.